The Postal Service just delivered a Canon T90 at my door step. I opened the box, inserted batteries, mounted a lens, and swiched it on. The T90 is a disconcerting camera, and I was in for a few surprises. Recently I’ve been looking for a manual focus camera with a larger viewfinder than my Nikon FE2, and a bit more feature rich than the austere Nikon F3. I wanted to play with more metering options (spot, multi-spot, highlight, shadows) than what the FE2 and the F3 have to offer. And at the same time, I did not want to spend money on a new family of lenses, which excluded Contax, Leica, Minolta and Pentax, and limited my choice to Canon, Nikon and Olympus. I could have splurged on an Olympus OM-4T, but $200.00 is a minimum for a working copy in so-so condition sourced in Japan, and the beautiful ones are many times more expensive. Nikon had no manual focus SLR that interested me (I have used the Nikon FA and the Nikon FG in the past and did not like them, and the N2000 and N6000 are just mid level autofocus cameras deprived of autofocus). That left us with Canon, and the T90. The T90 is a very interesting piece of hardware. It’s at the same time a formidable precursor of all the Canon high-end EOS film and digital cameras to come, a shameless copy of the Olympus OM-4 (metering system, OTF flash), the most elaborate of the Canon manual focus reflex cameras, and an evolutionary dead end. It was launched in February 1986, one year after the Minolta Maxxum 7000, and was only manufactured for a few months, leaving the spotlights in favor of the new EOS autofocus product line, presented in March 1987. 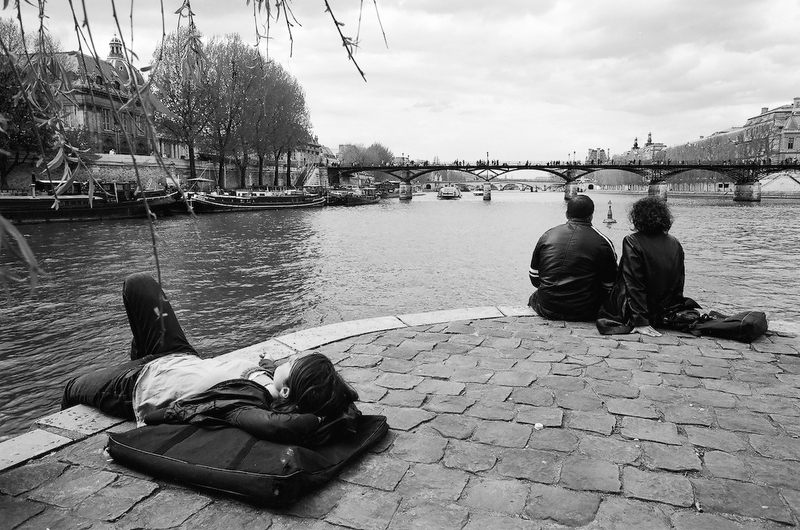 It is often seen as a test bed for the ideas successfully implemented in the EOS cameras. It’s a way for Canon to finish a long chapter of its history on a bright note, and for its faithful customers, one last opportunity to spend a lot of money on a high-end camera supporting the FL and FD lenses. A lot has been written about the T90, its genesis and its legacy. There are countless descriptions and reviews of the T90 on the Internets. I listed a few links at the end of this post. I won’t write the nth review here. Today, I’ll share my first impressions, trying to understand how the camera can fit with the way I take pictures. And later, after my summer vacation, I’ll come back with more definitive conclusions. LCD display on the right side of top plate, control wheel, shutter release and spot metering buttons at the top of the grip. The ergonomics of a modern camera. And it’s heavy. Almost 900g with the batteries. You don’t expect that much weight from a camera with a plastic body. It’s also very large (in the modern dSLR world only the EOS-1d and the Nikon D5 are larger), but because the FD lenses are much smaller than the huge f/2.8 autofocus zooms that the pros mount in their EOS-1d and D5 today, it does not look as big and intimidating. It’s a manual focus camera. With no matrix metering. In that sense, it’s a camera of the past, already outdated when it was launched. Like the Olympus OM-4, it’s an attempt to put the photographer at the center of the exposure determination process, when the market was rapidly going in the opposite direction and adopting “evaluative multizone” and “matrix” metering. The default metering mode – center-weighted average – does not permit you to lock the exposure, and unless you’re willing to operate in full manual exposure mode, you need to switch to the “partial” (large spot) or “spot” (the really tiny spot at the center of the viewfinder) modes as soon as you want to gain a modicum of control over the exposure of your image. The “partial” setting lets you lock the exposure values as long as the shutter release button is half pressed, and the elaborate multi-spot, highlight/shadow and exposure memorization functions are only paired with “spot” metering. 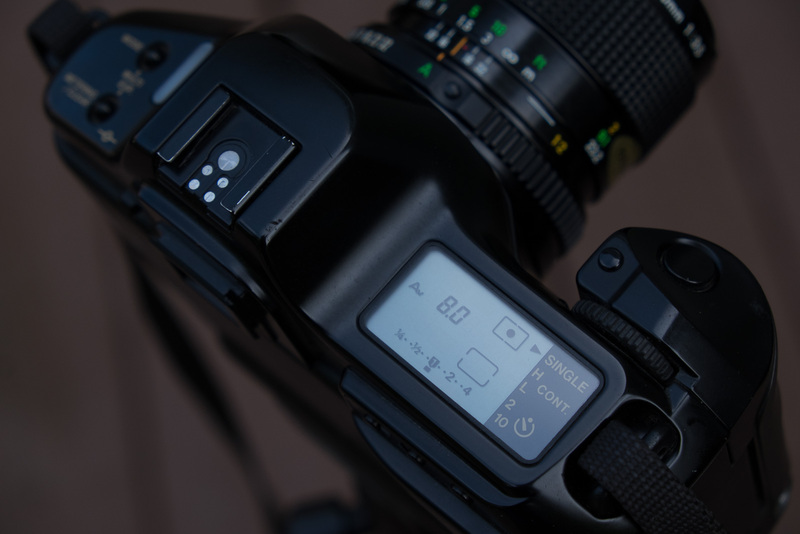 It should give you enough control over the exposure without ever having to switch to the manual exposure mode. The other reason to use the T90 in auto exposure mode is that the manual mode is weird. It’s really a manual mode (not semi-automatic), unless you operate with stopped down metering. If you operate the camera at full aperture (with a Canon FD lens unlocked from the “A” position), the LED display in the viewfinder only shows the recommended aperture value. But it does not give you any indication about the current aperture value, and there is no + or – sign in the viewfinder to tell you whether your image is currently over exposed, under exposed, or just right. The meter of the camera operates as a hand held light meter would, and it looks as if the meter is not coupled to the shutter and aperture commands of the camera. It may work in a studio, but it’s far too slow in the street. However, if you press the “stopped down” lever at the left of the T90, a full featured semi-automatic mode becomes available. Which is fine if you shoot with FL or FD lenses at a wide aperture, but unusable at F/11 and beyond – the viewfinder becomes too dark. It’s frustrating to have to operate FD lenses stopped down, but using FL lenses is surprisingly pleasant. One last gift of Canon to its faithful customers. Canon T90 with a Canon FD 50mm f/3.5 macro lens. Thirty years later an EOS 1d does not look that different. When Canon launched the EOS system in 1987, the FL and FD lenses – which are absolutely non-compatible with the EOS cameras, immediately lost most of their resale value. 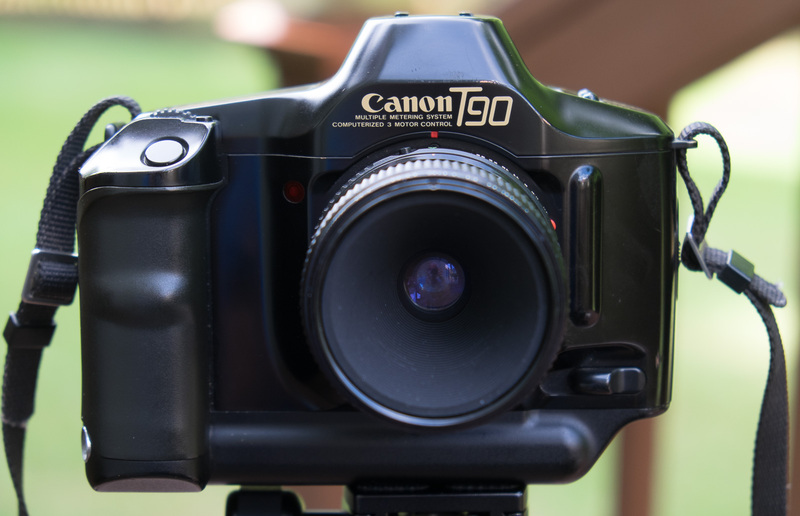 After the T90, Canon only launched one camera using FD lenses: the T60, in 1990. But it’s a rebadged Cosina semi-auto camera (a precursor of the Olympus OM-2000), not a true Canon. So for a very long time, FL and FD lenses – that could only be used on cameras last manufactured in the mid eighties – remained in the “orphan equipment” category, and were cheap, much cheaper than manual focus Nikon lenses, that could (and still can) be used on many current Nikon dSLRs. The rise of mirrorless system cameras (Olympus, Panasonic, Sony and Fuji), and in particular of the full frame A7 series from Sony has given a new lease of life to manual focus lenses, and to Canon FL and FD lenses in particular. As a result, fast (wide aperture) Canon FL and FD pro and high end lenses have become seriously expensive (as usual, sliding aperture trans-standard zooms remain on the cheap side). Canon used to propose a very large selection of FD lenses, with different maximal aperture and different qualities of glass in each category (from the ultra-wide angle to the super-tele), but they seem to have neglected the trans-standard zoom segment: they never offered a constant wide aperture or pro-quality “L” lenses in that focal range, and the T90 was never bundled with a zoom, but simply with the conventional 50mm f/1.4 prime lens. Interestingly, the T90 is a good bearer of FL lenses (the semi-automatic exposure mode only works with the lens stopped down, there is no benefit using FD lenses if you only want to shoot in this mode), and thanks to an adapter (and to the short flange distance of the FL/FD family), it also supports 42mm screw mount lenses. (*): and it happened repeatedly this week. I never had experienced such a thing before (my Nikon FE2 also has a very bright focusing screen, and I often use it with Nikon autofocus lenses, but I never found myself waiting for the camera to focus on its own). (**): it’s not as loud when operated in stopped down mode. The iris command mechanism is probably the loudest sub system in the camera. (***): there has been a lot of speculation on why Canon decided to ditch the FD lens mount in favor of a totally new EF mount in 1987. Some say that the FD mount was too expensive to manufacture, that it was too small and could not be made solidly enough out of plastic, some say it was too small (diameter) and did not leave enough room for the electrical contacts needed for future evolutions, some say it was too small and made the design of ultra-luminous (or ultra-wide angle) lenses too difficult. Some say that the aperture control mechanism of the FD mount was too kludgy and made basic features offered by competitors, such as depth of field preview and semi-automatic exposure too difficult to implement on multi-automatic cameras such as the A-1 or the T90. 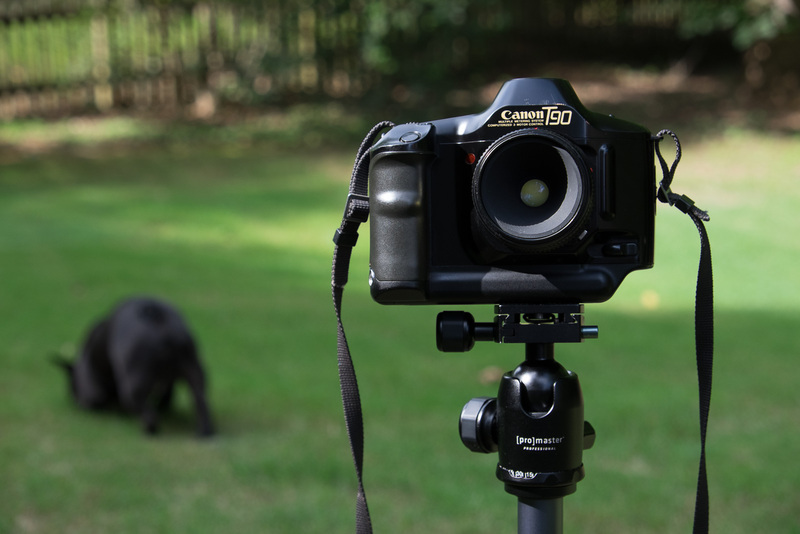 Canon T90 on a tripod and black dog.